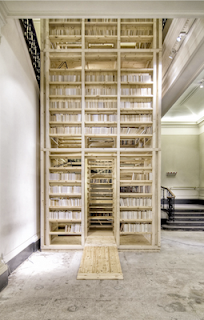 The Ark Booktower above was part of an exhibition of small spaces at the Victoria and Albert Museum this summer. 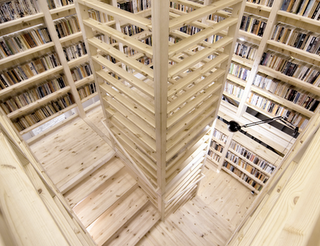 I especially liked this one which was a booktower, enclosed by books with occasional seats at different levels, so one could stop and browse. If I had one I would never leave it. Alan has started a new publishing venture that I've mentioned before, called Quid Pro Books. It's based on publishing primarily in eBook formats (many of them) as well as print when needed. As a long time user of Kindle, Alan could see the benefits for scholars and students in using these formats over print. Joe Hodnicki: That brings us back to your just released corrected and annotated edition of Holmes' The Common Law, which, to remind readers, can be acquired directly from Quid Pro Books and on Amazon in print and Kindle editions. Alan Childress: I am actually proud of what I did there, and not just did for others. The Annotated Common Law is a new book that I believe will become a standard in every library or prelaw-student’s gift basket. I took a great book and decoded it with some 200 notes. All Holmes’ historians remark what a “difficult” read it is. Not really, if you just explain some basics to readers as they go, like “case” is a writ and what a writ is, or translate Latin and Greek. Some of his speech patterns are quite old but sound like my Southern uncles—in fact my ancestors may have shot Holmes. I think I deciphered him well and I explain legal terms, like chattels and bailments, for nonlawyers. I’m surprised no one did this before. Plus again with the proper footnoting, nice presentation on the page, true page numbers, etc. Its value in digital is simpler: every previous digital form of the book traced back to a poor scan which left out words from the margins and had him saying modem and docs. Holmes is hard enough without guessing his every eighth word. And most recently, Alan has published my colleague's, Lisa Webley, book, Adversarialism and Consensus? The Profession's Construction of Solicitor and Family Mediator Identity and Role. I will write about this more anon. But do read the interview. It's full of interesting titbits as well as informing us about the future of legal publishing. I am glad to see from the website that you don't have to own a Kindle to read the ebooks, just have an amazon account to download. They refer to multiple digital formats too. You're right. Alan Childress has been very careful to ensure that access is available in many formats. I use a non-Kindle reader because I like the EPUB format which Kindle doesn't support. This is an essential element of the process: one device can't control the market, even if it might drive some of the technology. So, What Kind of Stuff Do You Write? Wondering What to Do on a Sunday? Are Partners Any Good at Running Law Firms? Diversity in the Legal Profession?